Gaze Coin has launched an Initial Land Offering of virtual real estate on a Mars replica to fund its epic open VR universe game on the blockchain. In an initial land offering (ILO) funding an open VR universe survival game, Gaze Coin is offering virtual real estate in two cities located on a Mars replica developed by Gaze Coin. The cities are the base stations for the company’s open VR universe survival game that rewards players in Gaze Coin for exploring the connected virtual reality metaverse. The Mars initiative was inspired by Elon Musk's challenge to entrepreneurs to create businesses on Mars, issued in March at SXSW 2018. The land sale creates a new blockchain-driven model for financing games by selling a finite amount of virtual real estate inside the game to investors. Investors then earn ‘gaze’ (engagement) based rewards from gamer engagement occurring on their property- allowing property in high traffic areas to become valuable. Property owners may also use an ERC721 “rent” token tied to their property to gain a trackable share of revenues earned by tenants. 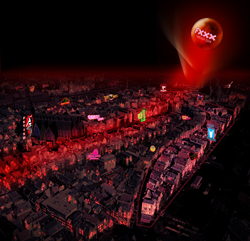 The sale uses finite land models to establish two virtual cities: one the host of a Battle Royale-style game and casinos, the other a red light district inside the game environment inspired by real geographical locations on Mars. Red Planet is the location of a Battle Royale-style ‘deathmatch’ game run by cryptocurrency gangsters called Dream Channel. It is the most lucrative game in the Universe played in Lucydia, a place where dreams are won, lost, bought and sold. A second city on the planet is the location of a rival game in a red-light district called Fantasy. City #1: Lucydia: Dream Channel began in Lucydia, a city built in the shape of Burning Man’s “Wheel of Time” and only accessible by taking the dreaming elixir, “Gaze”. The game pits players against each other in a deathmatch inside their dreams rewarding them in Gaze. Lucydia is located on top of the Olympus Mons area of virtual Mars. City #2: Fantasy: The status quo changes when an unsuspecting Dream Channel player, Lucy, has a dream about a game called Fantasy played in the streets of Amsterdam – requiring its own ‘Fantasy’ elixir. Lucy’s dream is the most coveted prize of all and she becomes the target of those who wish to wrestle control of it by all means necessary. Fantasy is based in the Utopia Planitia area of Mars (where the NASA Viking project landed in 1971) and is a replica of Amsterdam’s red-light district. The game uses a property model that is finite, strictly limited and fixed to the exact size of the two city structures. However, the entirety of virtual Mars is open to other developers who can establish other cities using X-Y-Z coordinates provided by the platform. Land can be linked to other worlds via the Gaze Coin Wormhole Transport System. Gaze Coin technology rewards property owners for user engagement. Owners of land, billboards, benches or other real estate in high-traffic areas of the game will receive revenues corresponding to the engagement occuring on the real estate (ie. a player watching an ad). In the case of VR or WebGL games, Gaze Coin uses eye tracking to reward players for simply looking (gaze triggering content). Property in both Lucydia and Fantasy are known as Dreamspaces – where dreams, wormholes and content are stored. Dreamspaces must be purchased by either Gaze Coin (ERC20) or (in the case of Fantasy sector) Fantasy Coin (ERC20) and then converted into a unique property ERC721 token. Dreamspace owners may either serve their own content or “rent out” the space for others to serve theirs. Owners that rent out their Dreamspace use an ERC721 rent token and earn a simple revenue share charged on all transactions that occur within the Dreamspace. The Fantasy Red Light District pre-sale begins on September 16th, 2018 at 12:00pm EST and will last through November 30. “High noon” was chosen as it is the same time as the beginning of the historic Oklahoma Land Rush in 1889. For more information on the land sale, please visit https://gazecoin.io/land-rush and https://fxxx.io/land-rush.